Things I Learnt from Cartoons! Hi people. Hope you are all good. Hope you are all well. Today, I would like to take you on a trip down memory lane. I was arguing with my Aunt just last week. She was telling me not to let my daughter watch too much cartoons. My daughter is just 4 years old, what am I suppose to let her watch? The Fate of the Furious? Cartoons paved my childhood, I loved them and still do. Yes, I am a grown woman who still loves watching cartoons occasionally. I went on and pointed out things that children learn from cartoons. I mentioned a whole bunch to her, such as the ones below…. What could you probably learn from Johnny you ask? Well he was the most confident cartoon I have ever known. He taught me to always believe in myself regardless of what the odds are. He always got up and continued moving no matter how many times he was slapped or punched. Confidence is such an important characteristic in this day and age and I would want my daughter to have that. As I remember, he also taught me to raise that single eyebrow. He was awesome! This was such a cute cartoon for me. I used to find the obsession with the Juju balls hilarious. I learnt the value and acceptance of culture. Mike was taken to a whole new world, with a different people. Away from everything that she was used to. But she made friends in her new community. She learnt of their ways and their customs and she felt right at home. The world is full of people with different cultures, traditions and beliefs. Each group of people is just as beautiful as the next. Lu and Og were also very accommodating to Mike and accepting her as a friend. Well, maybe Og more than Lu. Now this little pup was a life saver. He would always save either Muriel or Eustace or both. Yes, you could always see that this dog was scared, and trembled to the core but he would amazingly always sum up the courage to save people. He faced aliens, robots, weird strangers and French Speaking ducks. With courage, we can face and conquer all our fears and all that is holding us back from moving forward. With courage comes the strength that will fuel your journey. Just like how Courage always made it, you can make it too. He proved that its okay to be scared, but as people watch you quiver with fear, let them also watch you take the first step with courage!! Mummy had a chicken, daddy had a cow! Hahahaha, what are the odds of two perfectly normal human beings having a cow and a chicken for kids? I don’t know, but all I know, all I remember is how happy this family was. Regardless of how cow and chicken were all kinds of different they still cared and loved each other. So we need to know that, siblings and parents may not always compliment each other and we all know that all families have their imperfections. We must just always learn to love our parents and siblings regardless of how different they are from us. Family is life…..cousin Boneless and all. Yep, this little short nerdy kid taught me to embrace your talent regardless of how other people will look at you. He loved science and had the neck for inventing things. He didn’t care about what DeeDee or anybody else said. So if you are a brother who can cook incredible meals, or a lady that can lift the weight of the world, so be it. Have the confidence to see where your talent can take you. Do not let anyone tell you that it is lame; it is useless or it is nerdy. These are just people and that is what people do. You might never know, deep down they may be jealous of you. The monsters are always just people. Yes, I paid attention and saw it like it is. Every single time the monster was just a person. A person that has set out to sabotage you. It is a person trying to slow you down or scare you away. Envious people will do anything to see you fail. Trust me people can go to extreme measures. And no, in reality they do not wear costumes or masks. They just smile in your face while they go behind your back and plot against you. That is how people can be heartless sometimes. These monsters are not strangers. They are always people you know and people who know you. Family members, friends, neighbors you name it. They pretend to to care but yet throw daggers at you the moment your back is turned. Learn to read people and try to chose who you associate with wisely. Well, those are my lessons from a few. I think my baby will be watching cartoons as much as she wishes because I know she is learning. Oh my gosh, some of these are my childhood favourites! I used to love Johnny Bravo! Well..I grew up watching cartoon too..but I limit it now for my gal as she is still quite young and I prefer to use her time to play and develop her sensory skill and all other skill. I do notice she pick up quite a bit from the cartoon though. Nowadays she only watch from the movie theater with all of us so we can discuss about it after that. That is an awesome idea, watching the cartoons together! I will definitely do that and help her pick up the important lessons. And yes, it was an effort to get her to love sports or riding her bike just as much as cartoons. Other activities are very important too. Hi, thank you so much and thank you for the follow too. I just read some of you posts, you definitely have my follow. I don’t know any of these except Scooby Doo, I must be a bit older than you! As long as you enjoyed Scooby Doo, we are friends already! Me too! But I guess they will also have their favs. I love my classic cartoons! Loved this! Makes me think about my favorite cartoons when I was a kid! I love your take on these cartoons. My kids love Dexter’s Laboratory and that is an awesome takeaway from that cartoon. Thank you 😁. We all love that little geek. These bring back so many memories! Dexter’s Laboratory used to be one of my favorites. Both you and my husband! He’s a cartoon fan for life and will choose them over a non-cartoon every time. I’m a little older for you and genuinely feel like cartoons have gotten…less for the following generations unless they’re preschool age. What do you think? I had everything from underdog to currents the cowardly dog and my kids don’t even have Saturday morning cartoons. Yes, I feel the same way. Children these days do not enjoy cartoons the way we used to. Obviously I voted for Scooby Doo! That was one of my favorites growing up! I to caught on to the fact that the monsters were usually friends or family! Lol, that silly pup. I’m glad you caught that too. I use these characters on the daily as references for my daughter. I’m glad it’s working. Haha, I love this! I watched a lot of these when I was younger–sometimes I even watch them with my own kids. I watched all of these cartoons when I was younger. My favorite was Scooby Doo. Exactly. You can’t help but cheer up. OMG! I love all these shows. I just watched the season finality of Samurai Jack. What great shows. I love this post for many reasons! I grew up with cartoons and they indeed teach many lessons! Cartoons aren’t just fun to watch, they’re packed with valuable lessons for the kids as well. I think these are all awesome. We definitely learn a lot from watching cartoons. 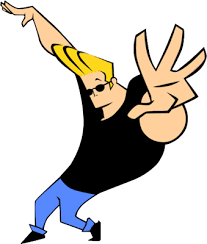 I loved Johnny Bravo as a kid. I found it hilarious. I loved Scooby Doo! It’s true, all the monsters are really just bad people! It takes me back to when I was a kid. I loved cartoons but it seems as if the quality of newer shows is a lot worse than when I was growing up. I too learned some great lessons from cartoons. I was a avid Sailor Moon fan when I was a kid, and it definitely taught me about friendship and being confident. I absolutely loved Scooby Doo growing up! It is one that I can’t wait to share with my kids as well – hopefully soon! I miss all those classic cartoons. Scooby Doo made me wake up early on the weekends! 🙂 Our classics were the best. My daughter loves them, im sure your children will love them too. Scooby Doo is what I voted for !! It is always the only one I have watched. Great article.